Two of the men are escorted away following the sentencing. KOTA SAMARAHAN: The Sessions Court here yesterday sentenced four Indonesian men to a year in prison and fined them RM1,000 each for illegally being in possession of 755 Oriental Magpie-Robins. Samsui Abdul Hadi, Supriadi Saripuddin, Agus Tahir, and Hendry Abdul Hadi – aged between 30 and 40 – pleaded guilty before Judge Marutin Pagan, who ordered for the custodial sentence to take effect immediately. 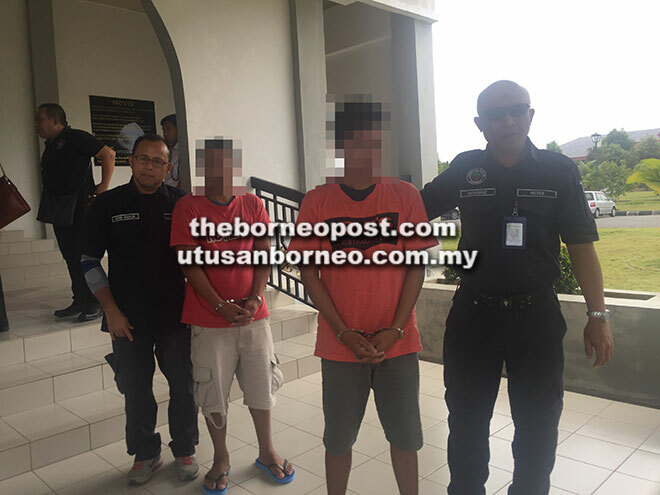 According to the facts of the case, army personnel stationed at the Tebedu Immigration, Customs, Quarantine and Security (ICQS) complex detained the four men as they were trying to escape through illegal points along the Malaysia-Indonesia border around 4.40pm on Sept 15. Upon inspection, the men were found with 56 cages containing wild birds. They also failed to produce any valid licence from the wild life controller to be in possession of the birds. The investigation revealed the 755 birds to be Oriental Magpie-Robins (Copsychus saularis), which are classified as wild animals under the Wild Life Protection Ordinance 1998. This contravened Section 379(1) of the Wild Life Protection Ordinance 1998 and an offence under Section 37(2) of the Wild Life Protection Ordinance 1998 (Chapter 26). Sarawak Forest Department officers Mohamad Muhaimin Zakaria and Mohamad Daud Jelani prosecuted the case.